Ruppert Grauberger, Department of Water Resources, Chief, Mapping and Photogrammetry Section -- "DWR’s Aerial Photography Indexing System"
Ronnie Richards, Senior GIS Analyst, Interwest Consulting Group -- "Relational Editing using Attribute Assistant in ArcGIS Desktop"
State employees are invited to sign up for the California GIS Council Email List Signup. 1416 9th Street (9th and N). 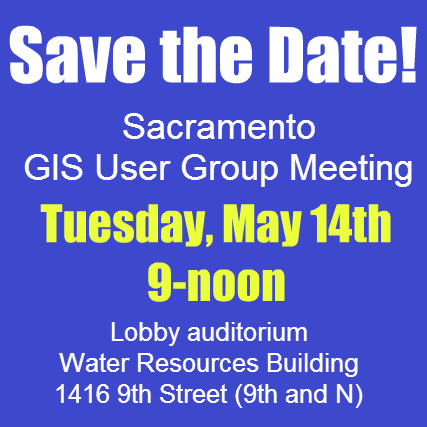 9:10 AM: Ruppert Grauberger, Department of Water Resources, Chief, Mapping and Photogrammetry Section -- "DWR’s Aerial Photography Indexing System"
9:40 AM: Ronnie Richards, Senior GIS Analyst, Interwest Consulting Group -- "Relational Editing using Attribute Assistant in ArcGIS Desktop"
10:30 AM – Noon: GIS Educational Resources – short program presentations and Roundtable discussion of GIS programs in the area. Audience participation is encouraged. 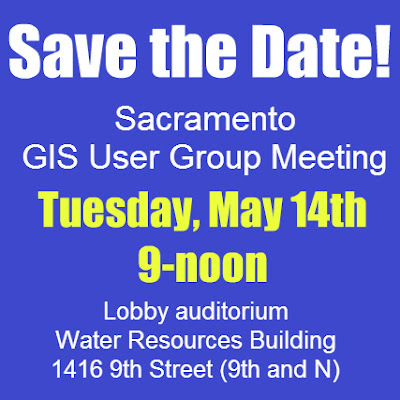 Save the Date - Next Meeting May 14th, 2013!